Keeping your food fresh and your drinks cold no matter where you are, the Classic Series II range of fridge freezers includes an advanced electronic control system with a dimmable backlit touchpad for easy night time operation, as well as a 12V power input readout for simple voltage monitoring on the display. Beneath the Classic Series II’s tough steel outer casing, a reversible basket with divider helps keep food and drinks stored neat and tidy, while a convenient drain plug allows for simple cleaning. Not only enabling full control of fridge settings including temperature and battery protection, the wireless transmitter included with the Series II allows remote display and control through LINX and smart devices via the Fridge Connect app. Rear-facing internal cabinet LED light with magnetic switch. Designed as an integral part of the interior cabinet, ensuring simplified cleaning and optimum use of internal storage space. Convenient drain plug for simple cleaning. Multiple storage options by separating fridge contents or alternatively allowing longer items to be positioned along the length of the cabinet. Optimized internal capacity includes separate compartment for fruit and dairy products. Durable, Secop Compressor with smart electronic control system enables rapid cool down to target temperature. Strong, recessed steel carry handles that double up as anchor points. Built-in 12/24V DC power integrated battery protection system. Backlit, dimmable LED temperature display/control panel - buttons illuminate upon touch for simple night time viewing and operation. Simple to use, large over-centre cam lock latch provides a positive seal between the lid and cabinet for maximum cooling efficiency. Tough, two piece injection moulded lid incorporates a recessed seal, preventing excessive wear and damage. Rear clips secure 12/24v and 100-240v cables, preventing the plug from being accidentally disconnected. Great for short trips or as a second fridge, the 37QT Fridge Freezer suits many compact SUV’s due to its low height and small footprint. Suitable for many medium to large SUV’s, the class leading 50QT ARB Fridge Freezer is your perfect travelling companion. Perfect for family trips or off roading, the 63QT Fridge Freezer features a low profile to suit roller drawer systems, larger 4x4s, boats, and camper trailers. With a huge capacity, the 82QT Fridge Freezer provides sufficient space to keep a touring family well stocked with cold food and drinks during extended off-road adventures. Granting users full control of the Series II Fridge Freezer via mobile devices, the ARB Fridge Freezer app can turn the fridge on and off, as well as manually adjust (or set via presets) the target temperature and display the target temperature, power input voltage, and fridge compressor status. Note: For Classic Series I (post-2014 models), the new transmitter and app can be used to display the temperature, input voltage, and compressor status. 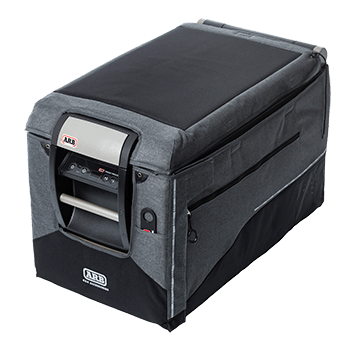 The ARB Transit Bag shields your fridge from dents and scratches while also providing additional insulation in extreme temperatures. Made of tough, durable canvas, the functional ARB Transit Bag features a handy side pocket for items such as the power cord or instruction booklet, as well as openings for the fridge’s rubber feet, power cables, drain plug hole, and bonus branded bottle opener.